IN 2019: SUPPORT THE CONSTITUTIONAL PFD AMENDMENT THAT WILL LOCK THE ORIGINAL PFD LAW IN THE ALASKA CONSTITUTION! *INFORM Alaskans that the People own resource wealth and legislation on the PFD. *ORGANIZE Alaskan voters to take action to stop the raid. *BUILD STATEWIDE SUPPORT for restoring all the PFD funds cut from past PFDs and a public vote for an urgently needed constitutional amendment to protect the PFD'S current formula. The Fund and PFD have been a phenomenal success in saving, investing and sharing resource wealth for all Alaska residents for 35 years. The Fund and PFD are under attack by government and business interests that want to spend the People's wealth without public consent. Politicians ignored PFD law and the majority of Alaskans over the past 3 years when they regressively taxed each resident over $5,000 through PFD cuts. This is just the beginning of the end of the PFD and Fund if Alaskans don’t work together to stop this theft. The Permanent Fund Defenders is a non-partisan, educational non-profit group. There are no paid positions. We are led by Alaskans with deep roots in our state including several founders who created the Permanent Fund. Our group welcomes all Alaskans, equal shareholders of resources in the Commons, who want to protect our assets and rights. We are dedicated to protecting the Permanent Fund system for today and for future generations. www.pfdak.com for more on the group. All funds go into communications and organizing to educate and mobilize Alaskans to defend our PFD and Fund. to build support and stop the PFD raid. There is strength in numbers. JOIN us and DONATE here any amount you can afford to secure the PFD. Join our member list with your email. Contact us to VOLUNTEER and go to work on this campaign. We need fundraisers, data entry and accounting help, media speakers, social media artists, and petition organizers. Thank you for doing your part as an Alaskan shareholder to defend the People's rights and wealth. 17606 N. Eagle River Lp. Click link --> Ch. 11 TV news story on the group with group leaders Dr. Jack Hickel and former AK legislator, Rick Halford. 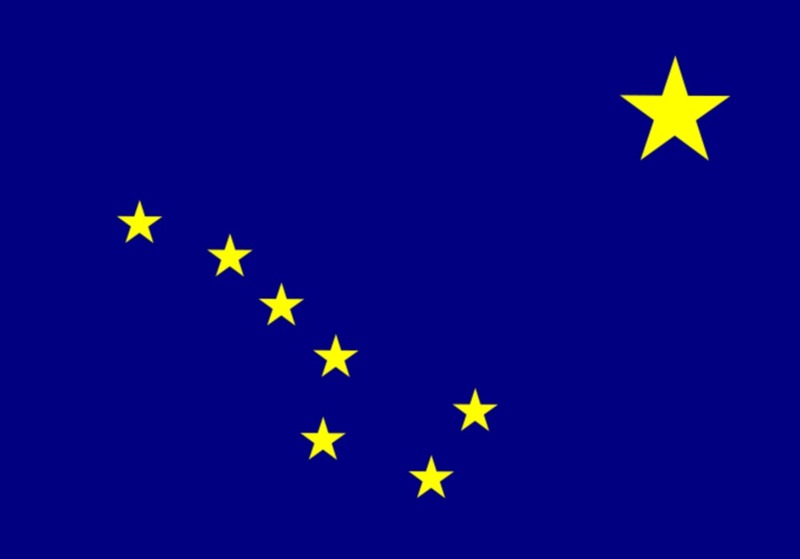 Alaska Owners, Unite for the Common Good! Defend the PFD! Join these 4th of July events as a volunteer at PFD info booths to inform voters. If you can't be there donate to get the booths set up and pass out flyers at the events. Kenai needs walkers in the parade! Contact @Permanent Defenders to volunteer. www.gofundme.com/pfdak to donate for these events. Thanks! 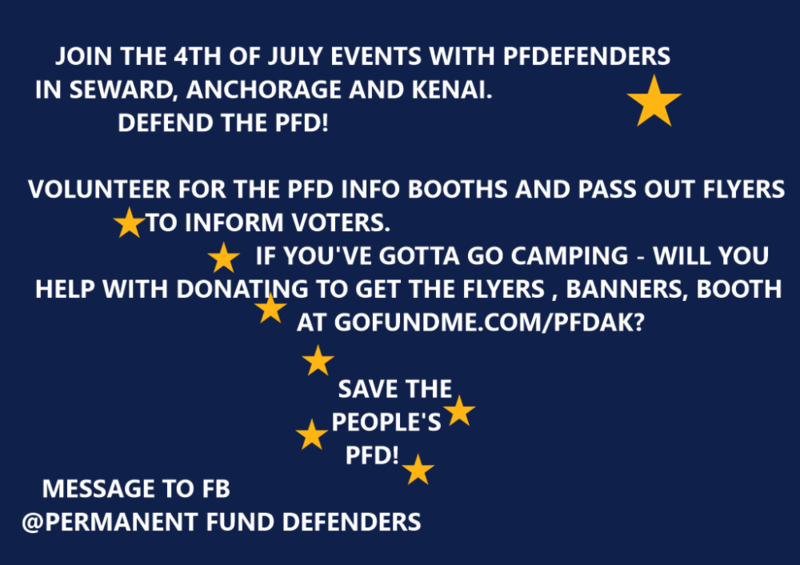 4th of July events to defend the PFD! Thank you for defending the PFD and Fund! The raid continues. Clem Tillion, Permanent Fund Defenders leader and founder of the PFD, warns Alaskans to keep up the fight against special interests stealing the People's money. We will keep working to get out the vote and pass PFD protection in the Constitution. Only Alaska voters can win this fight! FEB 12, 2018 — ACTION ALERT! Thanks again for your donation to protect the PFD. Your support is needed now contacting legislators. Here's how you can help. 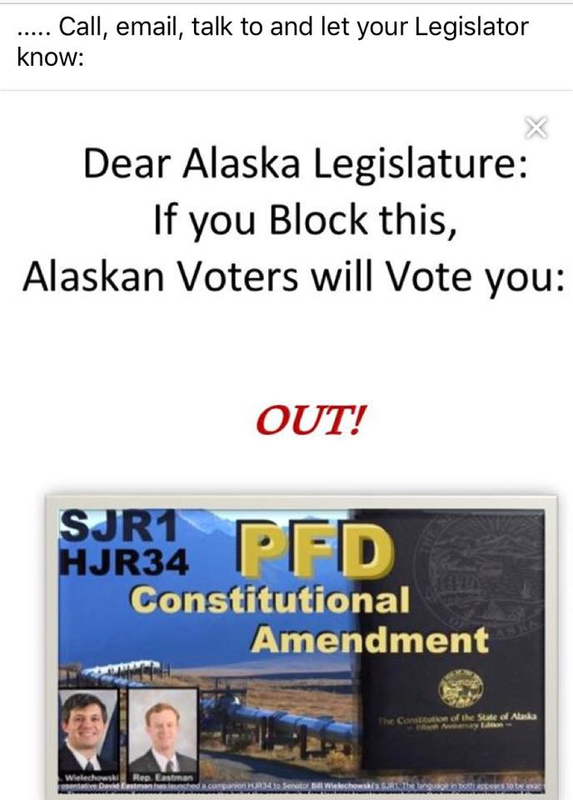 There is a bill called SJR1 in the AK Senate Judiciary Committee to give a vote to the People to lock the PFD in the AK Constitution where it is safe. The dividend is NOT safe in law where it continues to get cut. Or, just call and email these Judiciary Committee lawmakers to give Alaskans a hearing and a vote on this bill! Stop the raid on the People's money in 2018!